All the best Fast Track Nutrition Pro Meal Protein deals in one place! Compare prices from all the top online stores to find the best price on Fast Track Nutrition Pro Meal Protein. Fitness Deal News does the hard work for you of finding the best deals & coupons on everything fitness. At Fast Track Nutrition we have but one goal, to get your hard working body the nutrition it needs to thrive. No longer do you have to over think or over take supplements to get minuscule amounts of ingredients and little benefit. Our delivery system binds superior nutrition with probiotic powerhouse GanedenBC30 getting it to your digestive tract where itâs absorbed quickly and completely. Our Absorb More Take Less Technology means you get the support your body needs, and the results you deserve at a price that makes sense. Welcome to the Fast Track. Meal-replacement shakes are an effective and easy way to take control of your weight loss goals. Skipping meals is never an option when trying to maintain and promote a healthy metabolism. Busy athletes want a great tasting meal replacement shake that combines the proper balance of carbohydrates, fats, and high-quality proteins to provide sustained energy and appetite control. 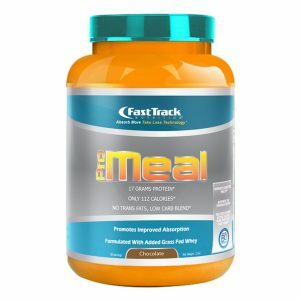 Fast Trackâs Meal Replacement provides 17 grams of superior protein, in a low-sodium, low-carb formula. Our vitamin and mineral blend does not contain any trans fats, aspartame, artificial colors or preservatives. Fast Track Pro Meal has an amazing taste and texture you will enjoy each day.